Think you've got what it takes to be the next Biki Member of the Month? 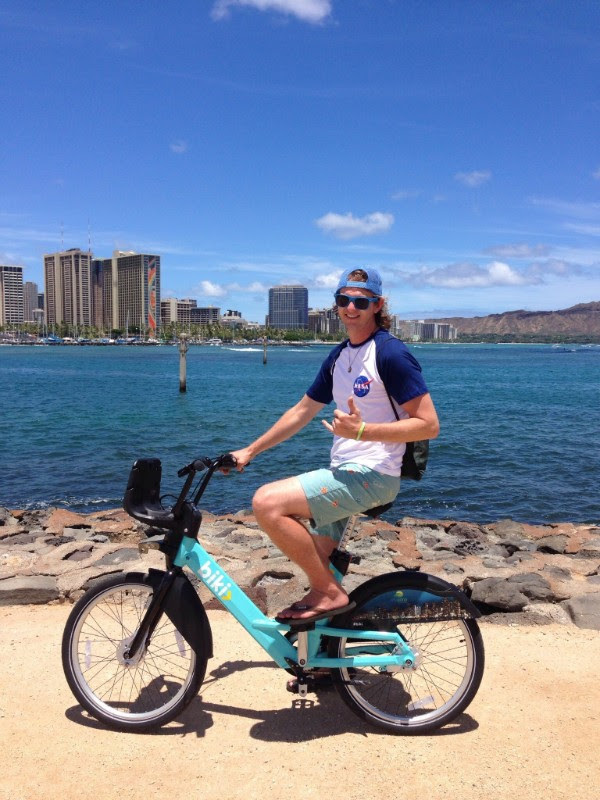 Send us an email with your Biki story or nominate a fellow rider: info@bikesharehawaii.org. "As someone who lives and works in town, Biki has been an amazing addition to my transportation options. I’ve been using this bike share program since the very first day it launched in 2017. I feel very lucky to have a Biki stop in front of my apartment building. I save gas money, get to places faster, and take in some fresh air and light exercise as well! 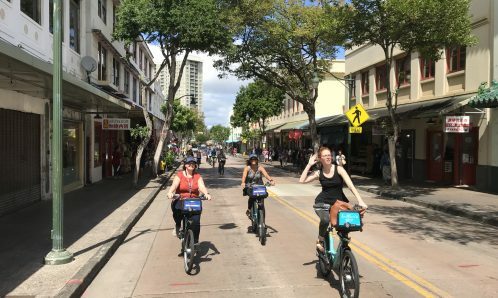 I’ve used Biki to cross off parking worries when going to events with big crowds like Art After Dark, the Great Aloha Run, the Honolulu Marathon, and concerts at the Blaisdell. Mahalo, Biki! Biki Tip: when using Biki to get to big events with large crowds, locate a Biki stop right before your actual destination by using the Biki app, and park your Biki bike there. By researching nearby stops before your targeted location, you raise your odds of finding a free slot where you can dock your bike! Biki Tip - Let the automobiles have the right-of-way. Don't assume that they are going to stop for you. Be a defensive Biki rider and enjoy the ride. "I like the convenience and affordability of Biki. There's a Biki rack where I live and one where I work. It's the ideal situation." "I didn't want to bring my own bike on my vacation and Biki is everywhere so I signed up for a membership. The $15 monthly option is a deal, even for a week-long visit. The bikes were comfortable, easy to undock and dock and the built-in lighting was a plus when I misjudged a sunset. I rode all over Honolulu and Waikiki. Pedaled to the community college, dropped off the Biki, did the Diamond Head climb, returned to the station, and pedaled home. On the last day I felt nostalgic as I racked my Biki." Plan: Free Spirit Plan - 300 minutes to use however and whenever you like. Favorite place to Biki - To catch the sunset at the beach! I ride from my place in Makiki to the new station at Barefoot Beach Cafe. "I got rid of my car about a year ago because parking outside my place was such a pain. I now use Biki for almost all in-town trips and then my motorcycle to get around the rest of the island. It's definitely a money saver. I ride almost every day and it amazes me how long these minutes actually last." Plan: Free Spirit Plan - 300 minutes to use however and whenever you like. This member also takes advantage of auto-reload, so every time her balance gets down to zero minutes we fill it up with 330 minutes instead! "Commuting to work is much easier with the newly installed Biki stations in Makiki. I am now able to bike all the way to my block instead of stopping at the Piikoi/King St station then walking the rest of the way. There are at least three Biki Stops within two blocks away from me. Instead of sitting in morning traffic, I can Biki from my home to work in less than 10 mins. It's a win win for me and the environment." Why? The bank of 300 minutes allows me some flexibility; I feel at ease knowing that I can ride from point A to point B within 5 minutes without having to fork the 30 minute single ride fee and still be able to have the remainder of the minutes available for the next trip. "It brings the "Fun" back in commuting to and from work. I work at an architecture firm in Downtown and I route permits to and from the Honolulu Building Department about 15 times each month. It takes me approximately 15-20 minutes when I am walking versus 5 minutes when Biki-ing." Plan: $15 Month - Unlimited 30-minute trips every day. In honor of Women's Bike Month, we have decided to feature the Biki Lady herself. 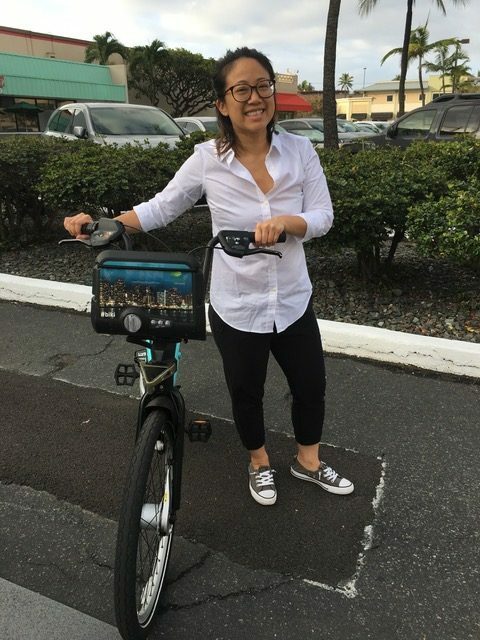 For the past 4 years, Lori has served as the CEO of Bikeshare Hawaii with the mission to bring bikeshare to Hawaii. 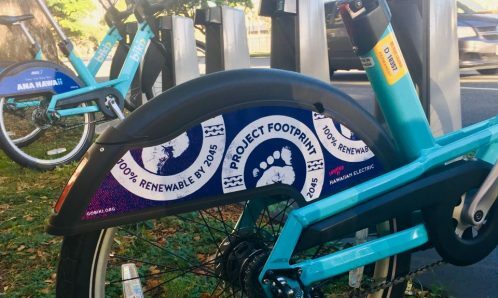 One of her goals, when selecting the equipment and launching the program, was to encourage ridership among women, who make up only 34% of bikeshare users nationally. As a result, the Biki bike is actually 10lbs less and easier to maneuver than equipment in other cities. We're proud that women represent 44% of Biki members. This mother of three, accomplished ironman triathlete and daily Biki rider will be retiring from Bikeshare Hawaii at the end of the month. Be sure to look for her riding around town rocking a Biki hat and high-heels. Mahalo for all your hard work, Lori, and best of luck on all your future endeavors. Lori brings in "Mike" the Citi Bike and "Jen" the Pronto Bike to the KHON2 studio to talk about Bikeshare in 2015. Watch it here. Why? We chose the free spirit pass because of its flexibility. We like knowing it doesn’t expire, and the auto-pay for renewal has proven to be seamless. "After a cumulative 80+ year hiatus, Biki Bikes have put these two retirees back in the saddle again! It’s true: one doesn’t forget how to bicycle! We appreciate Biki Bikes because they’re convenient, fun, and reduce time spent driving. We live downtown and have found Biki Bikes extends the geographic range of places we can easily get to without having to get into a car. Biki Bike parking is available near our apartment building, and usually within a block or two of the destinations we visit. The docking stations are easy to use, the bicycles are sturdy and well-maintained. Maybe the most surprising discovery is that in our mid-sixties we still find bicycling fun! We will arrive at our destination feeling exhilarated and fully alive. It’s a fun way to get good exercise." Why? It gives me a pool of minutes to use and I use it in waves so I don’t have to worry about my minutes expiring. "I love Biki because I don't have to worry about parking. My appointments vary week to week and if it’s within a couple of miles of my office, I Biki." Plan: $25 Monthly Plan - unlimited 60 minute rides. Why? Why not? It's the best one and its a small price to pay. I use Biki to commute to my workplace at the UH Cancer Center, during my lunch hour, and for fun with my husband for fun in the evenings and weekends. "The bicycle is comfortable. I no longer have to worry about getting my bicycle stolen and my husband is happy to not fix my flat tires anymore! I like having the option to commute one-way and take the bus home if the weather is bad. In my mind, if you can't get there by Biki, it ain't worth going." **Ying also made our Biki Rider Hall of Fame! She was one of the top 5 women riders during our first year. Plan: I have been a member of both $15 Monthly and $25 Monthly. Currently I use the $15 Plan because I am surrounded by docks around my neighborhood! Why? I grew up in Mililani and I realized how bad our traffic problems were becoming! I ride Biki because I want to be a part of a better solution for commuting to and from destinations. "I like the flexibility of Biki. You don't need to scour for parking or worry about your personal bike having mechanical issues. It's easy and the bikes are high quality. Using different bikeshare systems around the world and USA is my new hobby now. " Why? I enjoy the flexibility of the 300 minutes because I can use them as needed and not worry about having them expire. 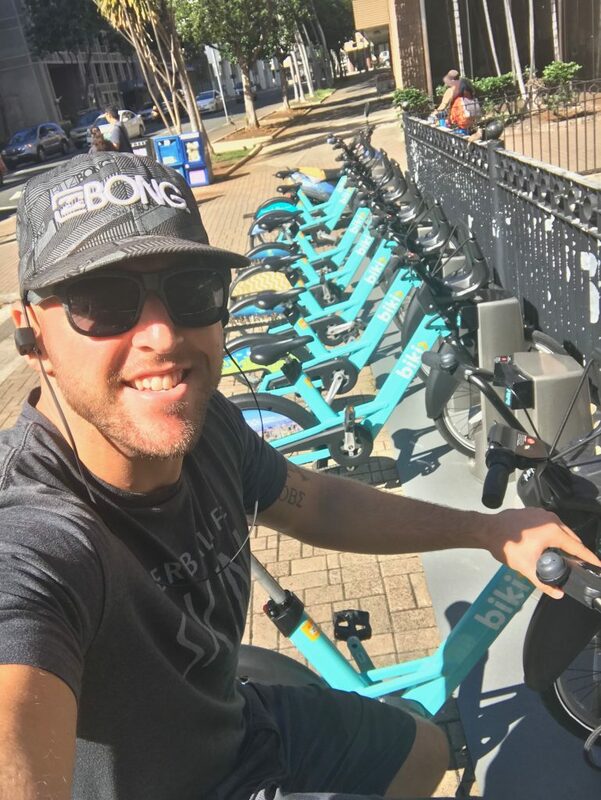 "I use Biki because it makes traveling around town far more convenient and even fun! I commute from the North Shore daily, but have to travel between jobs in downtown and Waikiki. At one point it took me 40 minutes to get from Waikiki to downtown after finding parking and walking to work. Biki is a godsend as it only takes 15 minutes, plus it adds pleasure to your day by allowing you to enjoy the fresh air and sunshine. Biki makes me more appreciative of Hawaii because it makes commuting fun, healthy, and stress free. I even invested in a water proof backpack so I could take Biki in the rain with no concern for my laptop." Why? For my purposes, 60 minute rides is more than enough for 95% of everywhere I need to go. $25 is a great value! "Biki’s a high. Its fun. It energizes me. Its helping me get in shape. I’m 60 but Biki makes me feel like a teen. It’s a newfound freedom where I can travel all over the city in less time. Combined with ride sharing and the bus, the options are endless. I’m self-employed and it adds hours to my workweek not having to deal with traffic and parking. My wife and I joke we can’t remember where we last parked our car. I’ve reduced my gasoline consumption by 80% and gained 3 or 4 hours a week not sitting in a car going nowhere. Bicycle quality is fantastic and very easy for a big guy to pedal." Why? I chose this plan because of the flexibility it offers me to go on longer distance rides. I can go for a good hour-long ride in the morning without any interruptions. Biki helps me stay in shape, and is way more fun and cost efficient than a gym membership. 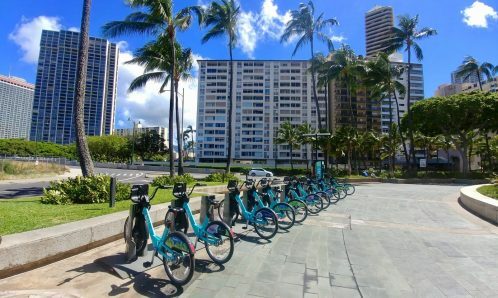 "As a student of Urban and Regional Planning at the University of Hawaii at Manoa, I am thrilled to see our city being proactive towards offering alternatives to automobile transportation. Biki will take more cars off the roads, which will reduce green house gas emissions and relieve congestion on our busy streets! Biki also is an affordable commuting option for those who can't afford the bus pass. Most importantly, it's healthy and fun! I wake up every morning and take Biki around town and along the coast for an early morning workout. It's the perfect way to start my day!" Plan: Free Spirit - $20 for a bank of 300 minutes to use however and whenever you like. Why? Jenn loves the flexibility of the Free Spirit Plan and appreciates not having to worry about the minutes expiring. "I love Biki because it's not just for people who are tall! I am 5’ and it can be challenging to find a bike that is safe and easy to ride. To all my vertically challenged friends, I recommend you try Biki. It is the best!" Why? 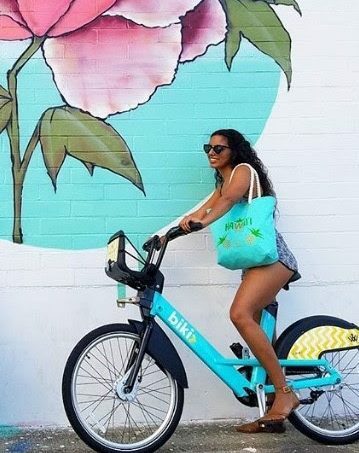 Lisette uses Biki mainly for casual rides and lighthearted adventures, so she opted for the flexible Free Spirit option. "I really enjoy the bike stations, not having to find parking, and not having to own a bike since my place has no room to store one. I think it's great during events around downtown when parking can be scarce"
Plan: $15 Monthly - unlimited 30-minute rides each month. Why? Vinnie completed over 600 trips in just 5-months, making him one of our top riders. He chose the $15 monthly membership since it is the most cost-effective option someone who rides so frequently! "I likes Bikeshare because it takes away the stress of commuting and eliminates the need for a car while living in Waikiki"